Offering years of experience in factory automation services, Mobile Automation excels in providing innovative automation and DCS system for the process control industries. We can work with you right through requirement specifications, detailed design, implementation, installation, start-up, testing, commissioning. DCS’ also known as distributed control systems are computerised control systems in which as the name suggests, the control is distributed throughout the system. Unlike a central control mechanism that uses central controllers, a DCS divides the controlling tasks. Therefore if any single component of the system happens to fail, the plant will continue to operate. Therefore a DSC consists of distributed digital controllers capable of executing control loops. The input/output devices (I/O) can be integral with the controller or located remotely via a fieldbus network. Today’s controllers have extensive computational capabilities and, in addition to proportional, integral, and derivative (PID) control, can generally perform logic and sequential control. From design to system installation, a DCS offers power and flexibility for any large commercial plant DCSs are ideal for control of manufacturing processes that are continuous or batch-oriented, such as oil refining, petrochemicals, central station power generation and pharmaceuticals. To get hold of our cutting-edge DCS design and installation services or to learn more about the development of any DCS, contact us today. We are available to do business 24 hours day, 7 days a week and will respond at any time of the day or night, weekday or weekend to ensure your full convenience. What is a distributed control system or DCS? DCS’ also known as distributed control systems are computerised control systems in which as the name suggests, the control is distributed throughout the system. Unlike a central control mechanism that uses central controllers, a DCS divides the controlling tasks. Therefore if any single component of the system happens to fail, the plant will continue to operate. To get hold of our cutting-edge DCS design and installation services or to learn more about the development of any DCS, contact us today (03) 9761 8500. Do you do PLC Programming and automation too? for new projects to coding modifications for existing systems. We can design and custom makes a PLC solution that meets your specific needs. Our PLC engineers work to ensure their programs are user-friendly and easy to navigate the logic during maintenance or system upgrades.For more information please call Mobile Automation today. We are available 24/7 to answer all your enquires and service all your automation systems (03) 9761 8500. 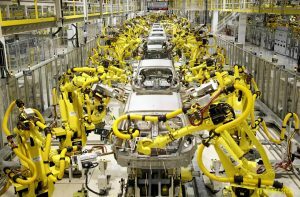 What are the benefits of automation equipment and services?